Comments: The drive to Columbus and back home was more exhausting then the race itself. I saw, over the course of my travel up and back, one car turn upside down, one in the concrete median and many cars in the ditch or stopped by the highway devider (metal strings) from crossing over to the other lane. At one point I was asking myself why I was even attempting this. Because I had people give me money to run, that’s why. After all this was for a good cause. I only collected $80, unlike the $400+ last year, but I hate pushing myself on people too much, and with the Leukemia & Lymphoma Society fund raising going on I don’t want to wear out my welcome. The race itself wasn’t nearly as exciting as the car ride, but it was just as slippery in spots. Unlike the Turkey run, I lined up a bit closer to the front. It also helped that they had the runners line up on High Street and the walkers on Nationwide Blvd. I battled side stiches again, but not nearly as bad as during the Turkey run. My goal was to run under 10 minutes per mile and I did that. I came in at 29:53, a 9:38 min/mile pace. Yesssss!!! Great day for a race! Comments: We could have not asked for any better weather. Granted it was a bit chilly at the start, but if you are not new to the sport you know what to bring to keep you warm (trash bag or throw away shirt). So all was well. The first 3 miles were a blur. It took me about 6 minutes to cross the starting line. I tried to run slow and managed an 11 minute mile the first mile. After that I gradually let myself go a bit faster, occasionally pulling on the ranes telling myself you still have the other half to run. I gued around mile 4.74 at the water stop. And then again at mile 8 something. I realized a bit too late that I didn’t want to GU until mile 9 something, but oh well. At mile 8 I ran into a coworker who had planned to run a 9:40 pace. He had slowed down to use the potty. We chatted for a while and I let him go knowing he was planning on running faster than me. At mile 10 I realed him in, he was slowing down consiterably. Around mile 8 I started looking for the hubby, but around mile 9 it dawned on me that he was suppose to be at mile 10. Good, because it gave me another mile to look forward to seeing him. And there he was a mile 10, waiting. I rewarded his patience with a kiss and moved on. My goal was to run up High street, a 2+ mile stretch with 2 inclines, without walking. I did just that. During that stretch I saw the hubby again around mile 12. He asked how it was going and I told him I’d break 2:20! Going around the corner up Nationwide Blvd was hard, my legs wanted to quit and my body was working overtime. But once I crossed Front street and it was all down hill from there I was running strong passing people left and right. I had set 3 time goals for myself: 1. Come in under 2:25, 2. under 2:20, and 3. under 2:15. My finish time was 2:17:24. I am very happy about that! I am currently floating on Cloud 9 and I am ready to race my next 1/2. Well, after I stop being sore. I PRed by 10 minutes and 2 seconds! What will the furture hold? I stepped on the scale this morning and I am officially no longer considered overweight. It’s been a long journey and was rewarded with a great race. My sister in-law, who ran the Detroit marathon today, after 3 years of trying, finally qualified for the Boston Marathon. We could have not asked for better running weather. It was a little cool and no sun. The 20 miler race group went out first. I recognized two people from work and wished them both good luck. 3 minutes later the 20k runners (117 of us) were off. The first 5 miles I ran an average 10:40 min/mile pace. In some ways I tried to slow down on the other hand I wanted to do really well. The next 5 were a little slower. My slowest mile was # 11 with a 11:40 split (that was one tough mile!). The last mile and change I managed a 10:35 split. I ran with my iPod (book on CD) and it really helped me to have something to listen to during the spectator-less race. For some reason I am disjointed with the time, thinking that I SHOULD be much closer to a 10 min/mile pace. But then I have to remind myself that I ran the fasted long distance race in my life”. My fastest 13.1 pace was 11:16 and here I ran a 10:52. Funny how the mind works. It gives me something to strive towards, that’s for sure! Whenever I can I register as an “Athena” (race category of females over 150 lbs). With my 173 lbs I do not feel guilty running in that class. Yesterday I finished 2nd in that category and walked away with a plaque. Woot! 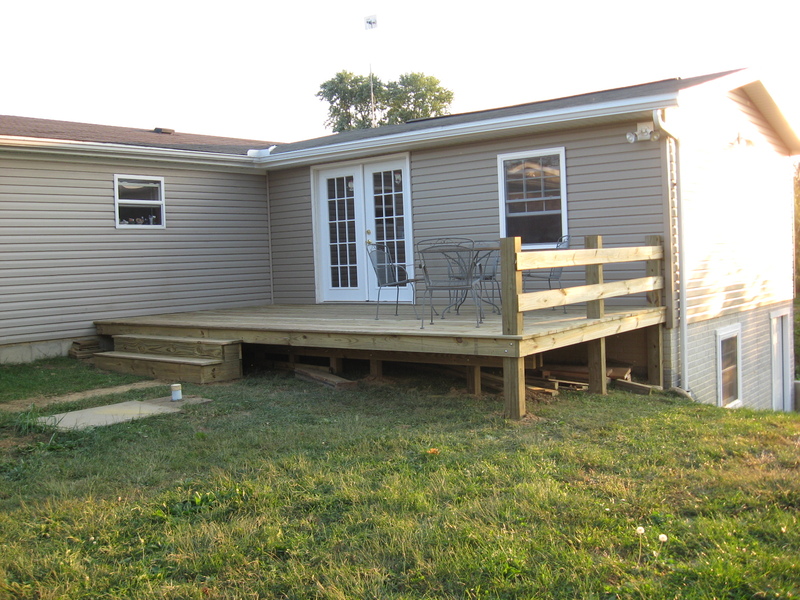 The deck at home is done. 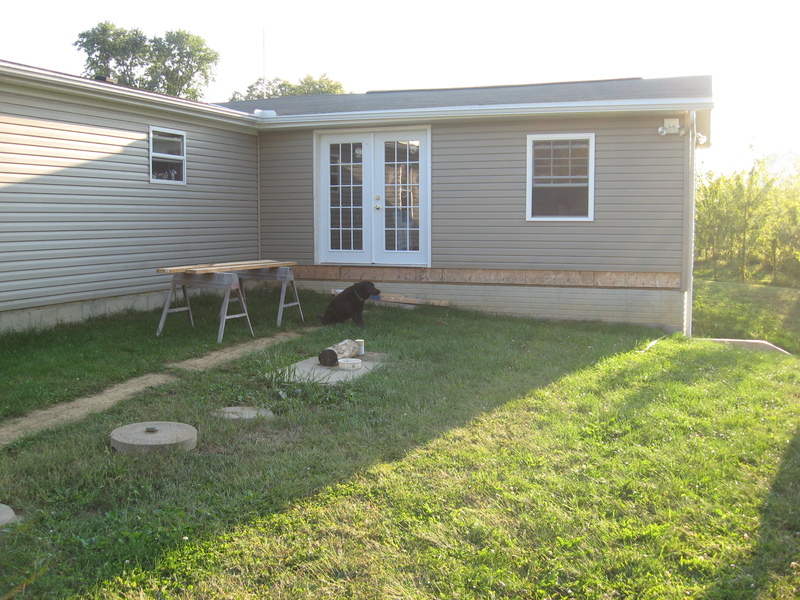 The hubby and I worked on it whenever we could over the weekend. I was not too much help on Sunday, but I tried! Comments: I don’t want to call it a race, but rather a run. So, the run went good. I intentionally ran slow in the beginning, because of the heat and not wanting to walk a whole bunch at the end. I did walk more at the end then I would have liked, but mentally I was in control. That is something that is important to me. The last few races I have finished somewhat in a daze and I didn’t want to do that this time. 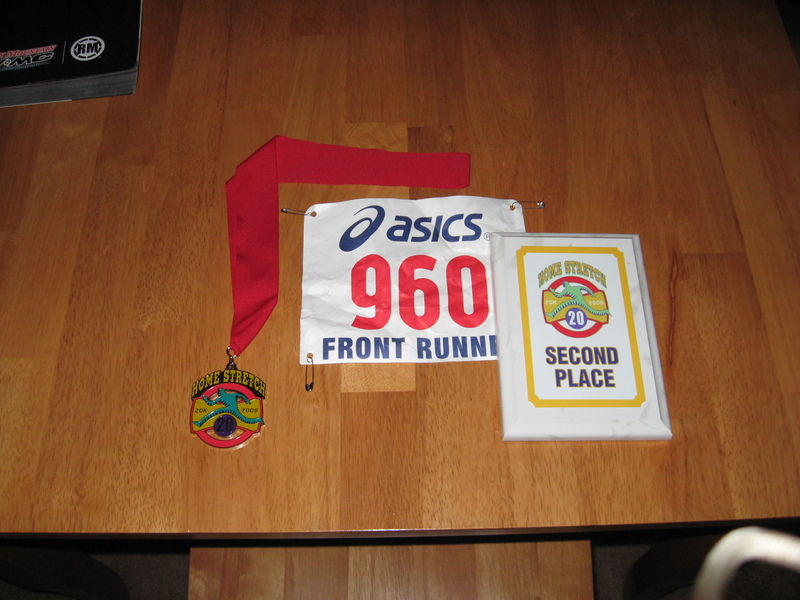 Granted, a 10k is not nearly as long as a 1/2 or full marathon, but it’s a start. The run was hot, with water station located at mile 2 and 4.25. Some good soul gave away water bottles at mile 3. Heaven sent! The water was ice cold and just what I needed. At mile 4.25 I traded the empty bottle in for some tap water (I am not a fan of tap water, but not too picky at that point). Like I said I walked a bit more than I had hoped at the end, but felt strong and actually picked my pace up the last .2 miles (9:42 pace). I am looking forward to doing it again next year. Comments: I was looking forward to the 10 on the 10th all week…today was the day! I made sure I went to bed early and got some good rest the night before. I really didn’t have a game plan, other than that I wanted to do well and run a total of 8 miles. Those that follow my blog know that I usually run 5 minute walk 1 minute. It has worked well for me in the past, but if I want to run a 5 hour marathon I really need to start running more/faster….so I decided to run 2 miles and walk a little. That’s just what I did. The only time I really struggled was at mile 4 and I walked more than I really should have. I had head wind just about the whole time and the last .3 of mile 3 where uphill (excuses, excuses, I know 😉 ) so I walked about two minutes to catch my breath. The last two miles were hard, but I pictured my blogging friends behind me, pushing me, and also in front of me, pulling me. And I finished the 10k in 1 hour, 07 minutes and 23 seconds. 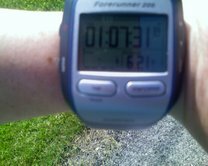 (notice the the watch reading 6.21, I missed the stop button on my Garmin the first time around lol) I am VERY HAPPY with my running time! I noticed a blister forming on my right food in the arch around mile 5, so I decided to take it really easy after the 6.2 and finished the last 1.8 at a 13.13 minute pace. I am pretty sure now that the blister is caused by my socks. I wore different socks (Brooks) during the 1/2 marathon, today I wore my Wright socks. I’ll have to go out and buy more of the Brooks. Thanks Nancy for making me go out there and doing this! I am looking forward to the next one. We (A., B., K., T., and I) met Friday after work at K’s house and headed to Indianapolis. It took a lot longer to get out of Columbus than anticipated, but we managed to get to the Expo by 8:30pm and got our packages without a hitch. After a yummy dinner and getting things ready for the next day we headed to bed. At 6am we could hear the music playing outside and a peek out the windows revealed that the starting corrals were already set up. (Thank you all you wonderful volunteers for getting up so early and setting it all up). We chowed down our breakfast and headed downstairs. A and K were cheering; B, T and I were running. B & T are much faster than I am and headed to their corral. I headed towards mine. At 7:04 I figured I had plenty of time to stand in line for the bathrooms, but at 7:20ish we heard over the loudspeakers that they are closing the corrals in 2 min!!! I was 4th in my bathroom line, but decided not to take the change and headed with the rest of the stampede to our respective corrals. The gun went off at 7:30am. 26 minutes later our group crossed the starting line! I don’t remember much of the first hour, only that I forgot to take at least 4 walk breaks because I was so busy watching people, listening to music, and maneuvering around walkers (that seriously should have started behind us). Around mile 10 I started to “die” and my neglect earlier to walk caught up with me big time! I used a lot of “ok, run to the next light (or whatever)” to make it through the next 3 miles. Sometime during that time I had a very serious conversation with myself in regards to wanting to train for a full marathon, but there I was not even fully prepared for a half! I finished in 2: 42:15, which is slower than my Columbus 1/2 from 3 weeks ago and the Indy course could not have been any flatter! As previously agreed upon I met up with A., B., K., and T. at the family meeting area under letter C. (C for Crazy!) We walked back to our rooms chatting away like little chickens, checked out, and headed to Cincinnati to cheer on our friends that were running in the Flying Pig 1/2 and full marathon. Thanks to some very generous people I was able to raise $410 for the Arthritis Foundation! I was thrilled about that; it was twice as much as I had hoped to raise. My intentions for this race were to run hard, but not to the point of total exhaustion (I was going quadding in the afternoon). I like running for 5 minutes and then getting a 1 minute walk break, that seems to be working very well for me right now, so that’s what I did. The whole run came to 32: 18, a 10:26 min/mile pace. Not a PR, but a step in the right direction. It was a very good run overall, I enjoyed it, it was actually more fun then when I ran it 3 years ago. For some reason I enjoy running in the streets of Columbus, and 3 miles seems like such a short distance now! I am looking forward to next weeks “8 on the 8th”; it’s been a while since I have run that far.